So, it’s come to the end of the year and it’s ‘Summer Holidays’ in Australia. Now, comes both fun and slow torture if you have children (especially those of school age). Fun, because it’s a decent break during school holidays and torture finding activities to keep kids occupied. I would rather my kids create things using ‘tech’ rather than purely consuming content all the time. Depending on the age of the children, will depend on whether they can write or type text into a travel journal. However you can always take images (add the text yourself) to create memories. Some of these apps then have the ability to convert into printed books. I still have my travel journal (and so does my sister) with all the things we collected like postcards, flyers, feathers and any other momentos that we collected on our ‘Expo Trip’ in 1988 from Tasmania to Brisbane. Can you add maps of locations where you have been? Can you share with friends? Is there an online portal as well as an app? Can you export the information at the end of your trip? 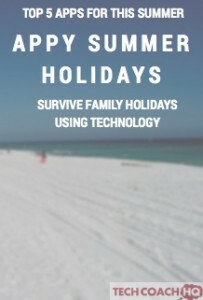 What better way to capture your holiday (even if it’s just visiting family interstate) than to write a book (or more specifically an eBook). There are some great options for both Android and iOS (iPhone and iPad) users. Can you import pictures from different sources? Can you add audio and video to make the book interactive? What formats does it export as? 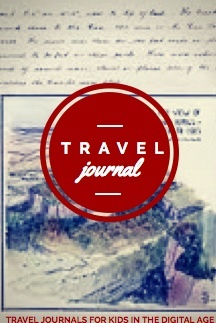 If you are going overseas, travelling around Australia or taking a ‘Gap Year’, setting up a travel blog is a great way to engage older children and develop a love of writing, (maybe some geography skills) and ways to capture memories. Not only are there apps which can send ‘digital postcards’ direct to friends and family, but there are apps that convert your images into a real postcard (and send it to your chosen address). One of my favourite’s is ‘TouchNote’ which allows you to add an image, add text and then personalise. This card is then sent anywhere in the world. Postage is free for Australia (just paying for the card). For a digital postcard app: I highly recommend ‘Photocard by Bill Atkinson Photocard (free). This is free and easy to use for the kids. It comes with the ability to import images and add stickers as well as personalising it just like a paper postcard. Sending postcards or even just the concept of writing to someone is a dying art, so this is a way of still sharing those concepts. Puzzles are a great way to amuse the time and to stimulate the brain. I love the apps where you can use your own photos to create your own puzzles with varying degrees of difficulty. That should be enough to keep the whole family entertained…What are your favourite apps either iOS or Android that you like using with the family especially for road trips? Share in the comments below.